The title sets the tone: Le Grand Sommeil, by Howard Hawks (1946), archetype of the American film noir, presents the fictional and artificial world at stake in the work by Claude Lévêque. Le Grand Sommeil is an in situ installation, an environmental work specially designed for the museum. For this two-fold inaugural exhibition, two major ﬁgures on the French and international art scene were given carte blanche. For an encounter in two stages: two exhibitions, two publications. Two part of a single project. Each artist, with his own remarkable career, occupied the temporary exhibition space in his own particular way. After ‘Détour’ by Jacques Monory, it’s Claude Lévêque’s turn to lead us into ‘Le Grand Sommeil’. Beyond formal and chromatic links, their work, romantic and dandy, is ﬁlled with, and structured by similar poetic energy. Their œuvres, imbued with a sensitive appreciation of the world, are rooted in autobiographical questions and take radically different forms. In spite of their differences, both these projects draw us in: the visitor is totally immersed in an all-encompassing environment conceived speciﬁcally for the space. . Both artists are ﬁrmly rooted in the world. They do not try to escape it, but ‘work with it’. For ‘Détour’, Jacques Monory devised an installation, conceived like a ﬁlm, an intricate exhibition of ﬁfty or so paintings hung within a coloured spiral. Claude Lévêque, for each of his exhibitions, invents fresh scénarios for exploring space. Here, he proposes a new in situ installation that appeals to our gut emotions through a mise en scène where the atmosphere is intense, pregnant, weighty one might say, although ethereal. Le Grand Sommeil is an in situ installation – an environmental work specially designed for the museum. The artist constitutes a three dimensional-image. The objects are then theatrically arranged, turned upside down and along with some black light and specific background music, he manages to confuse our senses and natural time-space bearings. Claude Lévêque creates a childhood memory for us, a story without words, by assembling simple and recognizable elements. Rows of beds … from boarding-schools and hospitals, orderly and dependent on a challenging collective imagination. But the artist’s critical vision has upset this worrying order, working reversely. The black lights transform the inoffensive beds into phantasmal vessels descending from the ceiling as in tales or dreams. The ground has shied away and become a roof where window-like half-moons contain white balls fallen from the beds. Small balls and abaci. Game-playing memories. The bed is often seen in Claude Lévêque’s work but here it’s multiplied. Regarded uniquely, it evokes childhood, love or death. Regarded in endless numbers, naively reproduced, it becomes void of any symbolic burden and reforms to being emblematic of a group, an objectified world, with no individual experience. Background music reminiscent of commonplace and insistent tunes in cheap exotic restaurants, and a black light plunging us into a pretend-night replacing the metaphor of the long sleep. From this discernible phantasmagoria, we are revealed a vision and volition of the world. The artist indeed says order, but its reversal, plundering, upsidedownness … he’s obviously making fun of this moral principle and prepares for a rebellion, a bomb attack and hijacking. Childhood is recurring theme at the heart of all Claude Lévêque’s art, like the night which is always forwarding and creating unbalance and questioning. This boarding-school dormitory announces the fleeting end of order and hails in the start of a game which may now begin. Le Grand Sommeil is metaphorically like a literary work, a reading space … inviting us into its world where we don’t belong. The artwork will work like a fairy tale, using stimulating narrative about enchantment, rocking or reversal of the situation from the initiatory path. The visitor can play out essential life stages within this fictional area like childhood, death and experiment the fear of emptiness and absence. It’s an atmosphere that the public is encouraged to enter. Crossing this space will not, however, compensate for absence or loss which this artwork hereby emphasizes. Between May 19 and September 10, 2006, Claude Lévêque is presenting an innovative in situ installation called Le Grand Sommeil. This presentation was imagined for the MAC/VAL and follows on from the exhibition of Jacques Monory Détour (presented from November 18 - March 26, 2006) and is the second part of an encounter between two major artists of contemporary art in France. This encounter depicts the project presented by the museum – have French art history be related by its artists. The museum proposes artists to be architects of their exhibition, players and project managers of their works’ vision. For the first episode of this two-step encounter, Jacques Monory revealed an unknown insight into his work. For the second episode, Claude Lévêque lures us into a similarly tangible world experience but with a radically opposite expression. It challenges all our senses, creating a metaphoric distance between reality and the image. Using scenography, Claude Lévêque inveigles the visitor to become one with his work, the former thus confronted with their own life, echoed culture in a search which goes beyond the artist’s personal souvenirs. This game of sensations and imprisonment allows the visitor to be a player and let their imagination run free. Here the work is unique and spectacular using simple elements, each contributing to create a poetic atmosphere. Claude Lévêque relates his own story, among other stories. From a precise time in his childhood, he adds on others’ memories. By assembling objects, by the light, by the sound, by the notion of elements, transpires the story of a time, frivolous but universal. Claude Lévêque’s works often suggest the feeling of “déjà-vu” or rather “déjà-vécu” (already experienced). His work tends to resurface intimacy which leads to a common and shared space. His universe sweeps us along on our own life path thanks to clues: moments in life, signs of time which compose recollections, images of childhood which appear, troubling our minds. His evocations are often metaphorical and sometimes immaterial or vanishing. They create three-dimensional images and ambiances filled with upside down objects, music, lost memories re-emerging from an incessant childhood pursuing us. This new installation by Claude Lévêque will be presented in the temporary exhibit rooms spreading over 1350m². For this exhibition, a colour-catalogue of 208 pages will be published by MAC/VAL. Your installations create often-disturbing plastic universes between fiction and reality. What sort of principle does the Grand Sommeil fit into? 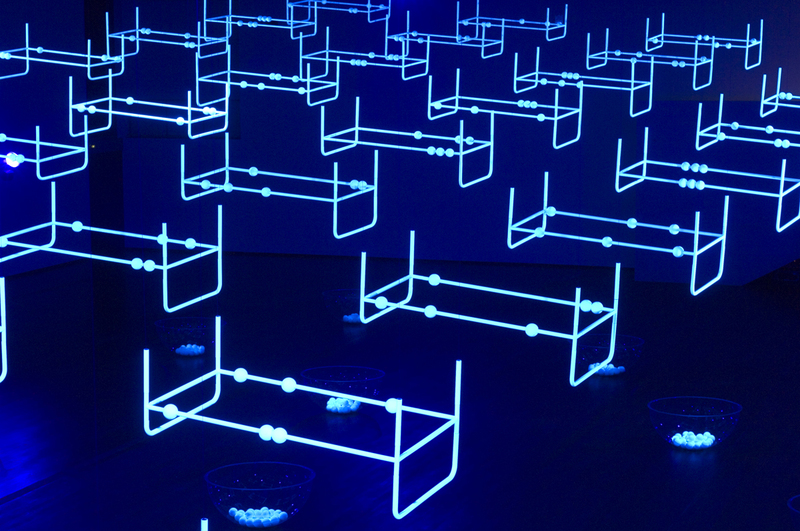 The area is designed to be the night, where the only things you see are the beds and the balls which appear like silhouettes. The hanging upside down beds, facing down, seem to be flying off towards the sky, or if nothing else, towards the ceiling. Alongside the theme of childhood, sleep and the night, the whole room is therefore designed using a principle of reversal and retraction. A certain number of recurring elements in my work emphasize the feeling of unbalance, of loss of references and heads towards disturbance, imposing a rupture with reality and creates a shield, a protection. Without ever proposing a truly stable situation, this work pleads against a hard and merciless world of totally transformed situations. Where does this moon-faced child come from – the visual for the exhibit of Le Grand Sommeil? Le Grand Sommeil is a reference to one of my first installations presented in 1984 at the Modern Art Museum in Paris thereafter most of my work remained equated to La Nuit for a long time after. For the visual of the MAC/VAL exhibit, I took one of the photos of children I had used at that time – Medhi, an actor of a 1960’s sitcom Belle et Sébastien. It was important for me to have this photo which is immediately recognizable. Belle et Sébastien is one of the first TV series, it is – or at least it was (!) – part of the collective unconscious. The other photos were those of anonymous children – using an emblematic iconography of childhood. With Le Grand Sommeil, I return to La Nuit, but in a radically different way. Since that time, I’ve evolved towards a universe which is much less marked by souvenirs and childhood, but more representative situations of today’s world. The production of this installation is another opportunity to work with the musician de Gerome Nox. The soundtrack for Le Grand Sommeil is background music, making most people think of Chinese restaurants. I was fascinated in Japan by the “patchinko” game rooms, a popular game, a bit like a fast-moving pinball. The atmosphere of these rooms is totally crazy and usually animated by completely unimaginative pseudo-Asian music blending perfectly with the perpetual noise and movement of patchinko balls. This hybrid music possesses this fully ambiguous temporality which fascinates me and when it’s dubbed today, you hear old melodies funnelling the most important part of our aural souvenirs. Patchinko obviously inspired the idea of balls attached to the bed poles like an abacus and the latter sends us back to a bygone era.